A New York State Police trooper was killed while responding to a call about a suicidal and possibly armed man barricaded in his home near the Pennsylvania border, according to WPIX. 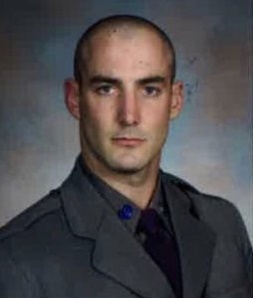 Trooper Nicholas Clark was among responders to a 3:30 a.m. 911 call from the estranged wife of school principal Steven Kiley, said State Police First Deputy Superintendent Chris Fiore at a news conference attended by Democratic Gov. Andrew Cuomo. Authorities said Clark was fatally shot during the response, and Kiley was later found dead with a gunshot wound inside the home in Erwin, near Corning, reports WPIX. The trooper was transported to a local hospital, with a flood of squad cars following and filling the hospital’s parking lot, according to the New York Daily News. Trooper Clark was 29 years old. He is survived by his mother, father, and brother.